KATHMANDU, July 26: The failure of the government and the Kathmandu Metropolitan City (KMC) to find a permanent solution for the management of the daily waste produced in Kathmandu has caused multiple problems in the capital city and the adjoining suburbs. Experts have said it has caused not only environmental problems but also traffic hindrance as locals resort to dumping waste on roads and streets. Health experts have warned of the possibility of an epidemic if the mismanagement of waste drags on. The landfill site at Sisdol, Nuwakot, where Kathmandu Valley’s waste is dumped, has almost reached its capacity. Moreover, damaged roads leading to Nuwakot have hindered the flow of garbage trucks carrying waste from Kathmandu. Therefore, the valley has now begun facing acute problems regarding garbage disposal as waste lies all over Kathmandu. As the door-to-door garbage collection service has been obstructed due to the lack of space at the Sisdol landfill site, the valley has been left with heaps of garbage. Areas in Baluwatar, Jawalakhel, Pepsicola, Teku, among others, are filled with garbage, forcing locals to live with the stench for the past many days. Garbage, which lies on the streets and at many intersections in Kathmandu has become a traffic nuisance as well. It has also made it difficult for the pedestrians. But as flies feed on the garbage which is now found right in the middle of residential areas, the risk of them spreading diseases has increased, according to experts. 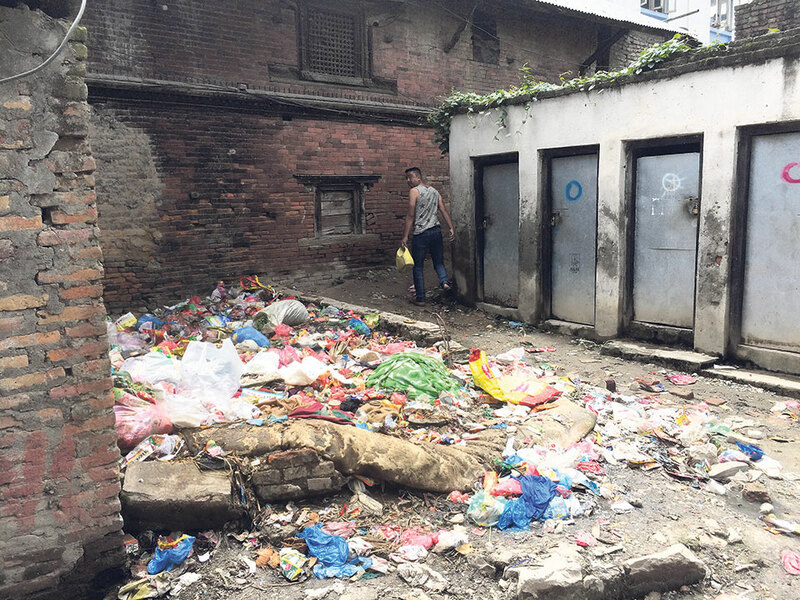 Dr Sher Bahadur Pun, who works at Shukraraj Tropical and Infectious Disease Hospital, said that this mismanagement of waste can lead to bigger problems. According to him, the sanitation and hygiene of the valley residents will be compromised if a proper solution is not found soon. He said that bacteria and viruses which grow in the garbage may infect the locals, and contaminate food resulting in widespread problems by increasing the risk of infectious diseases like diarrhea, dysentery, jaundice, typhoid and the like. “Risks of such diseases increase two folds in the monsoon when the danger of contamination of food and drinks is even greater.” He stressed the need for immediate action. But, with what is happening currently, the government is far from coming up with an alternative. Hari Bahadur Kunwar, chief of the Environment Management Division at KMC, said that because of the poorly-built roads which now face additional damage due to the monsoon, garbage trucks are unable to transport household waste out of the valley. Kunwar added that as the Sisdol landfill site is almost full, a new location must be brought into operation soon. However, as the construction of the alternative location at the Banchare Danda Landfill Site, which is two kilometers away from Sisdol has been halted, Kathmandu now faces the shortage of a dumping site. Kunwar said that it is the government and not KMC which is responsible for monitoring and supervising this alternative plan. He holds the government responsible for the delay in bringing this disposal site into operation. The Integrated Solid Waste Management Project which was introduced following the enactment of the Investment Board of Nepal (IBN) Act 2011 as an alternative to managing the municipal solid waste of the Kathmandu Valley has not been implemented even today. Uttam Bhakta Wagle, joint secretary at IBN, said that the change in governance from the unitary to the federal model has hindered the development of the project, which is one of the few alternatives that had been envisioned to manage the valley’s waste. Wagle added that the board has now finally declared the project and is holding negotiations so as to jump-start the project as quickly as possible.